If there is an error with your domain transfer to us, it displays as a status on the Transfers-In page in your Domain Manager. Once you resolve the error, you'll need to revisit the Transfers-In page restart your transfer. After you troubleshoot the error, you can restart the domain name transfer. Note: Transfers are active until they complete, or until they expire (30 days from the transfer purchase date). Once you resolve the issue, you'll need to revisit the Transfers-In page, where you can click Restart Transfer. Note: If the transfer is not listed (for example, it has expired) or the Restart Transfer option does not appear, contact our support department for assistance. Click OK. This will restart the transfer. Note: For .au domain name transfers, we will send the required transfer confirmation email to your registrant email address. After you restart a transfer, you must authorize it. For more information, see Transfer my domain to GoDaddy. Get an authorization code to transfer my domain to GoDaddy. Trasfer is decline. 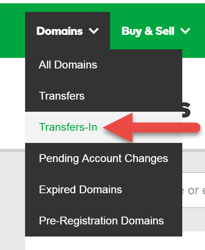 How I can restart transfer from another domain configurator to GoDaddy?